Supervisors and managers of Aberdeen-based scrap metal reprocessor and steel trading company, John Lawrie Group, have successfully achieved an IOSH health and safety accreditation as part of the firm’s ongoing commitment to personnel development. The Managing Safely accreditation takes the form of a rigorous week-long course, aimed at expanding and improving safety management systems, reactive monitoring, risk assessment and control, has been achieved by four senior-level staff of the firm. A further three of the Group’s staff will sit the course later this year.Commenting, John Lawrie director Ray Grant said: “We have experienced significant growth throughout the last few years. This success can be attributed to, amongst other things, the investment we have made in our systems and processes. "We are focused on updating and improving our procedures not only to sustain growth but in order to ensure the health, safety and welfare of our staff and clients. 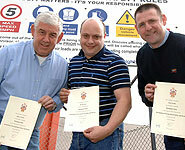 Managing Safely is run by Dyce-based training facility, Evolve, and is a week-long intensive course. John Lawrie, which employs around 100 staff throughout Scotland, the West Midlands and Houston, USA, achieved a turnover of £76m in the year ended 31 December 2006, an increase of almost 40% on the previous year.